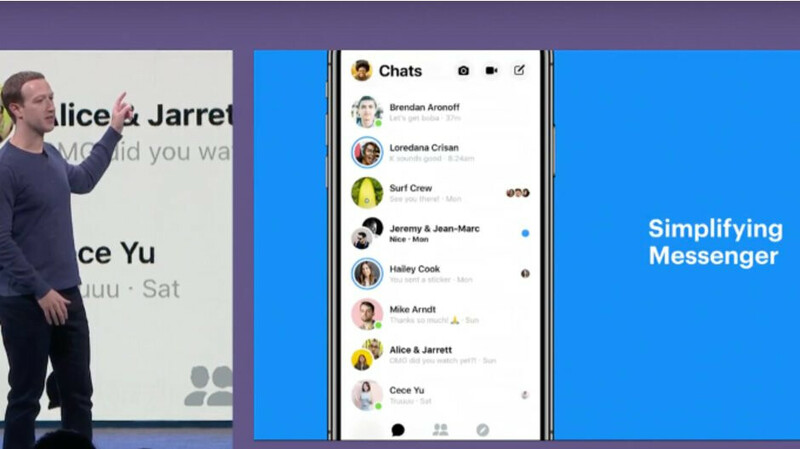 Facebook has been brewing an UI design update for its Messenger app for quite a while now and it seems it finally feels it's complete, as the new appearance is now popping up on user phones worldwide. It's a server-side update, so if you don't have it yet, don't go looking for an app patch in your app store — it'll come automatically. If you're among those that already have it, you may be a bit irked by the new appearance. Don't worry, you're not alone. The issue is that the new design is big, bold, and extremely white. This accomplishes two things that users tend to... adore. The searing white background is quite aggressive when you open up the app in the dark, while the big icons and bold text take up a lot of screen real estate. Suddenly, your 6-inched display doesn't look like it can hold that much content anymore. There's a silver lining, though — Facebook is testing out a Dark Mode for its new design, which means that you will be able to grey-out that bright background. When is it going to roll out? Hopefully soon. Whether or not we will be able to get a zoom-out feature for the freakishly large content — we'd wager that's a "no". But hey, on the bright side, you can now customize chats with color gradients! i hope they will release the dark mode early since it can also conserve battery. Dark mode / backgrounds only conserves energy on AMOLED screens, not LCD. It would also need to be full black app to get maximum benefit, coz anthing other still uses some energy to illumate the pixels. Not sure why people would use it much anyway coz WhatsApp and iMessenger are way more popular these days. People are leaving Facebook, certainly young people. The reason why everybody insists on super-white backgrounds and all are reluctant to offer a dark mode ? Sponsored content click rate is much higher than on the dark. Remember: for Facebook, YOU are the product they are offering to advertisers. I really like it. Feels much more modern and clean. Its not a snapchat wanna be anymore. Lol who still uses Facebook Messenger? According to the stats around 1.3 billion people. Good. Looks a bit less bloated. Wasn't it there for a while now? I’m Facebook free - had to manually get in contact with a human at Facebook to permanently delete my data. I also have my adblocker not load “share with Facebook” links on the page - to my knowledge Facebook (and other like G+, instagram, rumbler, etc - share buttons) use theses to track visitors. never understood how adding a dark mode is something that requires months on testing, literally just changing the background and invert the text. They didn't need to change what wasnt already broken.. They should go back to the original. The new one is MEH!